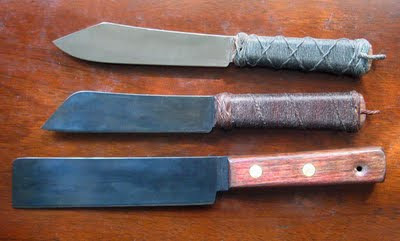 I finally got enough details worked out to begin offering some sailing knives for sale. I am still in the process of learning to use the paypal tools so there may still be some glitches and anomalies. Take a look and see what yo think, over the next several weeks I will be making more different types and styles of knives as well as adding other tools of the trade. Let me know what you think and any suggestions are more than welcome. how wide is it and what sort of an edge does it have- wedge or chisel? The blade is 1 1/2 inches wide at the handle side and it has a double bevel. 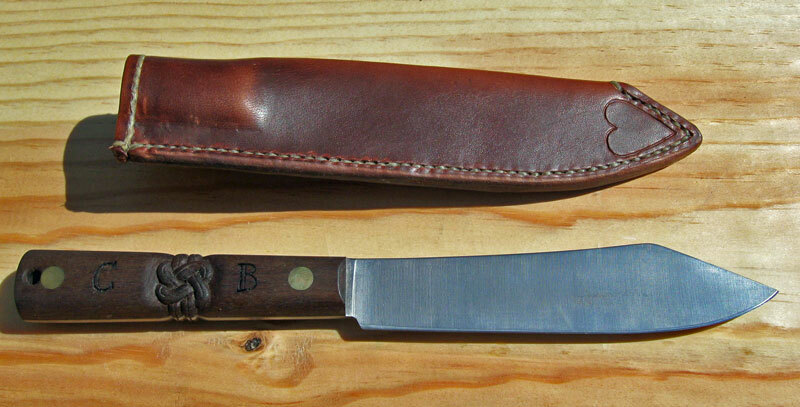 Here is another sailor knife that is available on the workshop page. Traditional sailor knife with 4 strand 2 color Moku grip and 4strand 5x9 two color turksheads, and a hitched lanyard ring. ? ! Zoinks ! ? Ohhh I like that one a lot Ben! Thanks Matt, coming from you that is quite a compliment. nicely done! how long is it? 6in blade, 10 1/2in overall (11in including the lanyard ring). Ben, that is absolutely BEAUTIFUL work, my friend! Thanks for the kind words, Mates. Masterfully done, sir. I have been searching for a Sheepsfoot Blade for a while. I just may have found what I be a'lookin for! I can custom make a knife to your specs. Send me a sketch or a description and we can work out the details. Here is another example of my past work. This one is my Wife's sailing knife, with carved true-lover's knots and burned details. The sheath is hot stuffed harness leather that is hand stitched and formed. Price Drop on the blades on the Blog.